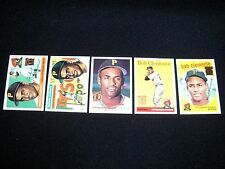 Bob Clemente~2019 Topps Icon Card Reprints#ICR-10(`57 Design Pittsburgh Pirates). Condition is Brand New. Shipped with USPS First Class Package. He is seen here in his Pittsburgh Pirates uniform. The card looks great and is in. 2017 Topps REDISCOVER TOPPS Insert Cards - Complete Your Set! 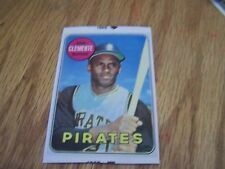 New Listing1997 Topps # 164 ROBERTO CLEMENTE Reprint Pirates lot (2)! STICKER IS IN GREAT CONDITION. BONUS 1998 TRIBUTE SET (RC1-RC5). One is the more common copper embossed variety. The other is a Gold embossed variety. Included in this six card lot are. THEY WILL ALWAYS BE WELL PROTECTED. WE TAKE GREAT PRIDE IN THIS. THIS IS A SWEET LOT OF CARDS. DONT MISS ONE OF THE GREATEST EVER. The card #'s are- 11, 21, 39, 59, 79, 105, 115, 146, 182, 198, 267, 304, 311, 365, & 445. The set is in NM to NM/MT to MINT condition. I have many other Pirates Team Sets available. Pirates Team Set! This rare card is gem-centered. BGS Black Label 10?. SGC 100 Pristine?. This card lot, which is Factory Sealed, is nice! It has no creasing & is well-centered (SEE PICs). The back is beautiful.